JACKSONVILLE, Fla. - Recently the Jaguars have had success finding starters in the late rounds of the NFL draft. In 2014 Telvin Smith was selected in the 5th round and has gone on to become one the best linebackers in the NFL. In 2017 Jacksonville selected Blair Brown in the 5th round out of Ohio and he is in line to become a starter during his sophomore season. 2018 Projection: Training camp is still two weeks away and 10 of the Jaguars 11 defensive starters are set in stone. One position battle that we’ll be watching at camp is strong-side linebacker (SAM). It would be a surprise is someone other than Brown wins that job. 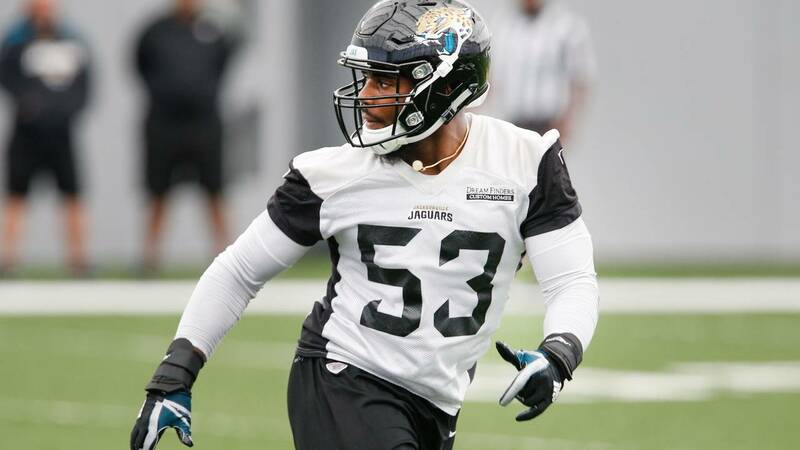 The SAM linebacker is on the field about 30-40% of the time in the Jaguars base defense. Brown would be filling the No. 3 linebacker role that Paul Posluszny played in 2017. Jacksonville spends most of their defensive snaps in the nickel package [five defensive backs] where Smith and Myles Jack are the only two linebackers on the field. As a rookie Brown was mainly a special team’s contributor for the Jaguars. If Smith or Jack were to be injured, Brown is next up on the linebacker depth chart.